Back on Miyajima Island! Catch Part 1 here. I feel like I’m in Ecruteak City. There are a few pagodas dotted about the island, but none as large and majestic as this one! Similar to the torii gate, you can post this pagoda from all over the island. In the foreground is Itsukushima Shrine, the floating shrine, which we will visit soon enough. Miyajima is beautifully Japanese. After the hustle and bustle of Tokyo and Osaka, Miyajima is a welcome change; from some of the most modern places on Earth to somewhere which captures times long gone. It’s a fresh breath of air, and truly feels otherworldly. This deer is ‘Deernise’, we became fast friends and she followed me around until she decided to eat some fallen sakura instead of hang out with me. Whatever, I’m not hurt by that at all. They really do love fallen sakura petals! I only included that latter picture of the deer as one seriously looks like you’ve just encountered in the wild and your Pokemon battle is about to begin. The famous gate pops up in the most unexpected of area! You get another sense of scale for it at these points, as we were not near the beach at all, yet the gate seems like it’s right in front of you. 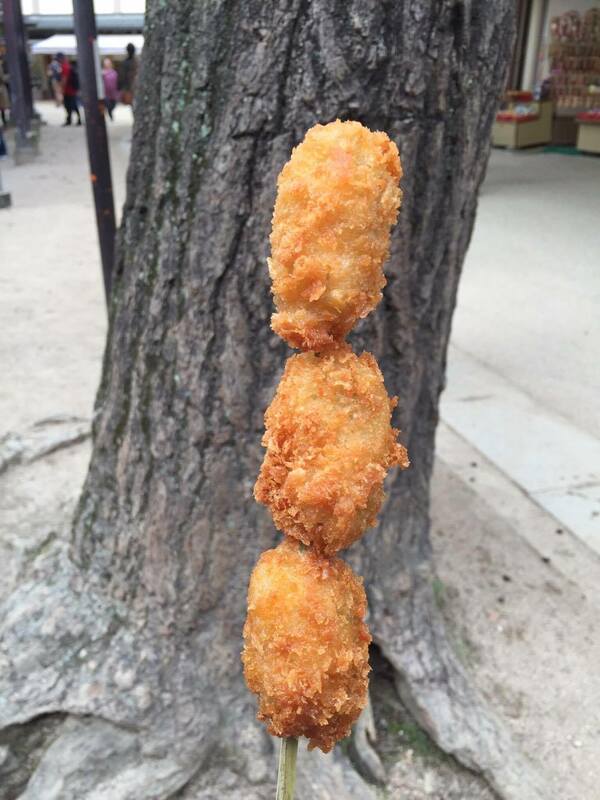 I had some fried oysters on a stick, these were pretty damn great. Deer were after some though!! The grand pagoda itself is up a rather steep set of stairs, but provides some incredible views. In land you can see the various rooftops on this side of the island leading all the way into the densely wooded mountains. And another side of the island reveals the wonderfully blue sea and the mainland! This deer seemed just as confused as I was about how it managed to get to the top of an extremely steep slope. It’s interesting seeing green trees right next to the vibrant pink of sakura! It isn’t often you see them intermingled so much. And now we head into Itsukushima Shrine itself! And my oh my is it red! The shrine largely consists of wooden walkways above the sand, which when the tide is in, will look like the shrine is floating. They are lined with lanterns at night, I would love to have seen that as well as it in the daytime. Despite being a major tourist attraction, the shrine at times feels deserted. I think this is as it is so bloody huge, and its pretty much a maze of identical walkways turning at various points, with many ending at dead ends! Although, this does make it feel like quite the adventure. Imagine the dark water at night, with hanging paper lanterns dangling from the rooftops. It’s a little more appealing than algae and damp sand, however the shrine is still impressive. There are a couple of pier like outdoor areas accessible also, these provide some nice views of the beach and beyond. Seriously, it’s red. The colours pop out massively to the rather plain sand, and I’m sure they do to the dark water also. I never tired of finding English ema plaques in shrines, it’s so nice to read consistently happy and positive messages. You’ll find nooks like this that are out of bounds whilst exploring! This is right at the back of the shrine, facing inland. I so desperately wanted to cross this bizarrely steep bridge, however it was out of bounds. Colour me disappointed. There is always something to be seen on this small island. The architecture is incredible, and dates back centuries. The upkeep is fantastic as well, despite these buildings being extremely old and facing the elements and sea breeze constantly, they look vibrant and new. It’s like a maze at times! Paths pop up all over the place! Heading higher and higher towards Mount Misen, Miyajima’s tallest mountain. Walking routes cross paths all over the island, one of the main things to do here is just ramble and get lost. This is always fun in new places, especially in a place filled with so many hidden treasures like Miyajima. This place is straight out of a fairytale. No matter where you turn, something beautiful stands there. It doesn’t feel real at times, but it is, and it’s right there in front of you! I’m so glad we visited during sakura season, the blooming pinks definitely added to the atmosphere. The futher inland you get, the less touristy it becomes. It’s easy to forget that a place as picturesque and beautiful as this can be someone’s home, and it can be a place they wake up to everyday. Imagine the view of the beach and the torii being the first thing you see in the morning. In my old flats, I would look out and see a busy road and a sorta shifty park, at home I see the fence across the road. I think I’d take the floating torii in the sea any day. As you can see, Miyajima houses a lot of residents, as well as a huge number of tourists. Here we enter Daisho-In Temple, a Buddhist temple at the base of Mount Misen. The grounds lead you straight to a hiking trail on the mountain. Various buildings line the grounds, and due to its location being on a mountain, they’re all over the place. Daisho-In is partially famous for the sheer amount of statues present on the grounds. Look at the tiny hat someone made! See what I meant about the statues and everything being on different levels? Daisho-In’s grounds are rather large, but a sizeable chunk of that is stairs and ground connecting the buildings. It feels almost like a campus. I somehow ended up making a strange route and ended up at another shrine with access to a mountain trail. I gave my respects to this God, and began my ascent up Mount Misen! You might be thinking that none of these pathways and staircases look too steep, and you’d be right! But after about 5 minutes of climbing in 25 degree celsius heat (I’m British, remember), I began to feel the effects. It was worth powering through for the incredible views. It’s not everyday that you can say you’re hiking up a mountain on a tiny coastal Japanese island. Well, unless you live on a tiny coastal Japanese island. It didn’t take too long to get here, but it’s hard to feel like you’re even close to the town anymore. It feels as if you’ve walked for days, and left civilisation behind. There are venomous snakes on the mountain. I omitted that when telling my mum that I’d been climbing a mountain on my own. Whilst climbing the trail through the trees it’s hard to see anything that isn’t immediately around you. The forest is so thick that you can’t see the island! Supposedly the views are amazing as you reach the top, however I didn’t really have the time for that, and I’d already ran out of water. I wasn’t about to dehydrate and die on this trip before I was able to go back to the Pokemon Center. Plus I’d spent a ton of time on various shinkansen writing a piece of coursework, I was in that too deep to die then. That’s one of my proudest achievements, I got a first on a piece of coursework I wrote in 2 hour bursts whilst on the fastest train on Earth hurtling through the Japanese countryside. I did tons and tons of prep for it, so I just got to writing whilst having some snacks, it was pretty great. And so back to the town we go. You have to try Miyajima’s token snack, Momiji Manju, small cakes, traditionally available in anko (red bean paste) flavourings, however you can get others like chocolate, custard and cheese. I had anko and custard, both were incredible, and they were only 100 yen each! You can buy them at most stores, you can also buy them in bulk boxes. And so, we headed back to the ferry terminal and we waved goodbye to Miyajima! What a brilliant place, I would class Miyajima as the best place we visited, up there with Arashiyama. As great and as brilliant as Tokyo is, I think the more rural side of Japan has so much to offer that you definitely cannot get elsewhere.